Every enrolled 4-H member is invited to participated in Jefferson County Fair — it’s our opportunity to SHINE and show our community what we’ve learned, made, and grown throughout the year. In 2018, our fair theme is “Bug Up” — a fun way to explore the diverse and often-overlooked aspects of life in our county. To learn much more about fair and to participate, please click on the links below. Hope to see you at fair! Monday, Aug. 6: 4-H Still-Life Exhibit Entries, 3-7 p.m. in the 4-H Building – bring all arts & crafts, posters & educational displays, record books, photography, and all other non-perishable entries. Please be sure to fill out and attach a Fair Entry Tag to each item that you’re bringing. Wednesday, Aug. 8: Perishable Exhibit Entries, 3-7 p.m. in the 4-H Building – bring all food & nutrition, gardening & flowers, and all other perishable entries. Please be sure to fill out and attach a Fair Entry Tag to each item that you’re bringing. Horse Vet Check, 5-7 p.m. Llama, Goat, Sheep, & Swine Vet Checks, 5-8 p.m.
Thursday, Aug. 9: Rabbit, Cavy, & Poultry Vet Checks, 5-6:30 p.m. in the Small Animal Barn. Beef/Dairy Vet Checks, 6-8 p.m.
Friday, Aug. 10: Reptile Vet Checks, 8 a.m. in the Yesteryear Building. 4-H Cat Vet Checks, 8:30-9:30 a.m. in the 4-H Cats Building. Wednesday, Aug. 8: General 4-H Fair Orientation #2 (Still-Life-only exhibitors strongly encouraged to attend), 7 p.m. in the 4-H Building, RSVP: tanya.barnett@wsu.edu. Horse 4-H Orientation (required for all Horse 4-H exhibitors), 8 p.m.
Thursday, Aug. 9: Small Livestock Barn Orientation (required for all Swine, Llama, Goat, & Sheep 4-H exhibitors), 3 p.m. in the Small Livestock Barn. Small Animal Barn Orientation (required for all Rabbit, Cavy, & Poultry 4-H exhibitors), 6:30 p.m. in the Small Animal Barn. Friday, Aug. 10: Bill McIntire Memorial Building Dedication, 10 a.m. – please plan to attend! Saturday, Aug. 11: 4-H Leader of the Year Recognition, 11 a.m. in the 4-H Building – please come and join us for this celebration with cake! 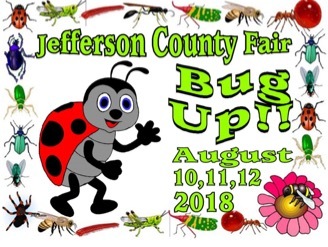 Throughout fair, please be sure to stop In the 4-H Building for activities like building beneficial bug homes, the “Bug Up!” photo booth, Roboctopi Robots, maggot art, bug tasting, 4-H presentations and so much more! Please check the daily Gate Schedule for these and so many wonderful events at fair. The Washington State 4-H Fair is a collaborative community event, showcasing and promoting the achievements and talents of youth as they work toward building their successful futures.